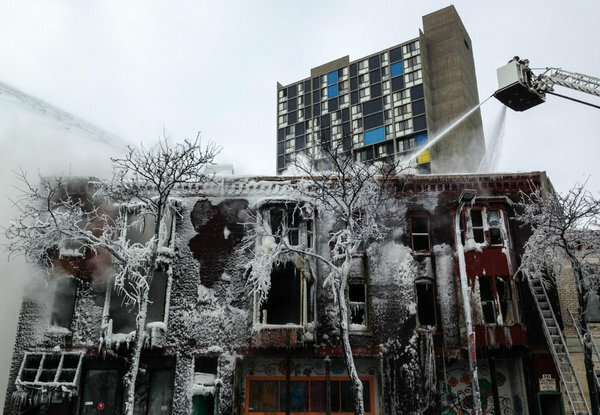 Minneapolis Fire Injures More Than a Dozen. http://www.publimetro.us/Fire destroyed a three-story building near downtown Minneapolis on Wednesday and injured 14 people, some critically. An explosion was reported in the morning. An explosion and fire on Wednesday destroyed a Minneapolis building that housed 10 apartments and a grocery, injuring at least 14 people, the authorities said. Most of injuries were burns or broken bones suffered by people who jumped — or were blown — out of rooms on the second and third floors. Officials were also trying to determine if all residents had been accounted for, Mr. Ball said. “The intensity of the fire means they have not been able to conduct a complete internal search,” he said. A Minneapolis police officer who first reported the fire said there had been an explosion, Mr. Ball said. A witness at the scene also told WCCO-TV, a local station, that he saw the building explode and three people jump out of windows to flee the flames. The station also reported that families at the scene said at least three people were unaccounted for. The fire sent flames 20 feet into the air, and thick billows of gray smoke pouring from the roof. About 50 firefighters responded, battling temperatures hovering close to zero that made their work even more treacherous. The explosion took place in the densely populated Cedar-Riverside area of south Minneapolis, in the heart of the nation’s largest Somali-American population. The streets are lined with small, quaint stores — grocers, cellphone and video-rental shops — along with community centers and mosques set against a backdrop of public-housing towers. The Minneapolis fire chief, John Fruetel, told reporters that nine of the 10 apartments had been occupied, but he said he did not know how many people were living in them. Firefighters experienced “heavy fire” on the second and third floors when they arrived, he said. “Crews made entry into the first floor of this structure, but conditions became very untenable very quickly,” Chief Fruetel said. Hassan Ali, an interpreter who lives in the neighborhood, said the grocery store, which sold halal meat, was popular among Somali-American residents in the area. A mosque sits behind the grocery store, but it was not clear whether it was damaged.